To give you a clue, look at the card selection and then the mission description regarding the opposition. 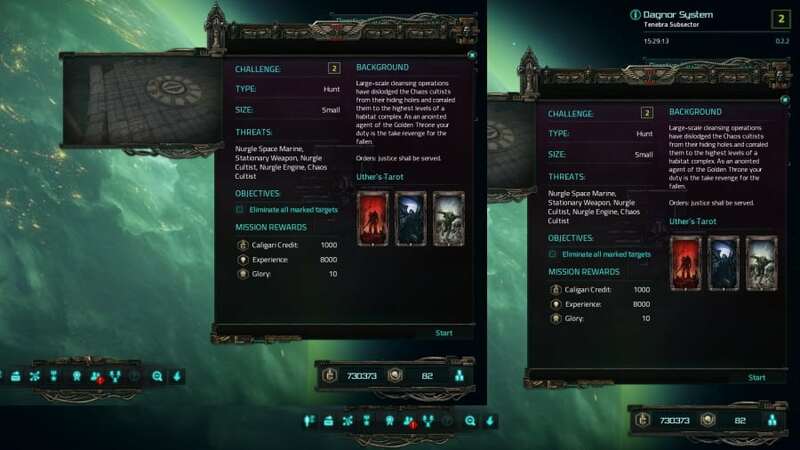 It is bad enough to repeatedly get the kill 50 Chaos Marines daily objective, when one just does not get missions for them, but then when a Chaos specific tarot mission is crafted and, you get Nurgle forces, that is adding insult to injury! Oh yes, and when I finished the mission I had the temporal field running, which crashed the game. Not sure why you are justifying why you put up the post? I only added some information from my own perspective on what I believe to be something related. I'll leave your threads alone from now on, my input doesn't seem to be wanted. My bad and good day. Regardless of whether this is unique or I have just been incredibly lucky not to have had any missions before that deployed purely Nurgle forces when a Traitor card is in play, it is still a bug and, hence the report. From what I have observed, irregardless of what mission/map you pick, the enemy and map set seems to come from a limited selection of options without any variation in tile formation. This is even more noticeable in tarrot missions for me, where irregardless of what mission I choose it will always be the same map with around 50 runs on that very same map. The only factor which seems to influence the mission map seems to be who hosts. Maybe what you have is a different issue but I would assume there is some link. Not trying to hijack, but thought the information might be relevant and therefore useful. So what you are saying is that we now have a few fixed maps and the tarot cards added challenges do not work. Because this is the first time I have selected the Traitor card and faced purely Nurgle forces. It's a known issue that the map generator system is still borked :) it's why it's literally the same 3-4 maps again and again, no matter what you pick. (at least for me) I don't even get random maps, it's the same one every tarrot mission unfortunately.